Modern intensive rice production has brought a large amount of environmental pollution and do not guarantee the safety of rice quality. Thus, to improve the farmer's rice production model to reduce agro-chemicals is of great importance to decrease pollution and to guarantee the security of food quality. Here, our experiments illustrated that nomadic rice-duck complex ecosystem (RD) could reduce energy input and increase both energy output and the values of the product safety index based on energy (PSI). According to the results of our experiments, RD and rice monoculture production system (RM) were -0.6 and -0.78, respectively, which indicated that the safety potential of products in RD was higher than that of RM. Protein yield based on RD was significantly higher than that of RM. The output/input, gross income, and net income of RD were 15.26%, 39.51%, and 44.80%, respectively, higher than that of RM; the data suggest that the economic benefits of RD were greater than that of RM. Consequently, as an intermediate-type technology, RD could become a feasible alternative that could reduce agro-chemical application rate without decreasing rice yield and increasing labor intensity. Furthermore, as an inheritance and development of the Chinese farming culture, RD is a classic Chinese farming technology withstanding more than 700 years of tests. Modern agriculture production is a very energy-intensive industry. Fuel and fertilizers (N and P) account for the largest share (>75%) of all energy expenditures in a mixed cropping system (Hetz ; Safa and Tabatabaeefar ; Ahmad ). In the past 50 years, crop yields have substantially increased, mainly resulting from the use of chemical fertilizers and pesticides, the development of new crop varieties, and the improvement in cultivation methods (Xie et al. ). However, excessive use of chemical fertilizers and pesticides raised pest resistance toward pesticides and increased the production costs (Paul et al. ; Tilman et al. ). What is more, their excessive use and misuse, their volatility, and long-distance transports eventually result in widespread environmental contamination (Kaushik et al. ). In particular, many older, non-patented, more toxic, environmentally persistent, and inexpensive chemicals were extensively used in developing nations, creating serious acute health problems and local and global environmental impacts (Ecobichon ). One way to optimize energy consumption in agriculture is to determine the efficiency of methods and techniques used (Bockari-Gevao et al. ). Thus, improving the farmer's rice production model to reduce the agro-chemical application rate is of great importance to decrease pollution and guarantee the security of food quality. Recently, with land circulation system being tried out in China, a large number of small-scale trial farms have been established in the rural areas of southern China (the range of small farm areas is 8 hm2 to 100 hm2), the farm will become the main force of rice production in the future. Continually adopting modern intensive rice production will continually increase the pollution to the environment and cannot guarantee the safety of rice quality. In addition, soil quality in the past 50 years, such as fertility and toxic substances (lead, arsenic), could not achieve the standard of organic agriculture. Consequently, there was an urgent need for a feasible alternative between modern intensive agriculture and organic agriculture, which could maintain crop yield, improve soil fertility, and decrease labor intensity. As one of the trial models, rice-duck complex ecosystem is one of the traditional farming technologies in China withstanding more than 700 years of tests. Previous studies indicated that rice-duck complex ecosystem was a form of ecological engineering that makes use of the symbiotic relationship between rice and ducks to effectively utilize nutrients, reduce the quantity of chemical fertilizer and pesticide, increase product safety and overall productivity, decrease pollutants discharged from the paddy field (Wang et al. ; Zhang et al. ), and reduce the emission of greenhouse gas, such as methane (Huang et al. ; Huang et al. ) and nitric oxide (Zhang et al. ; Li et al. ). In this study, energy evaluation method was applied to analyze efficiency of resource utilization and optimize energy consumption. Compared with the rice monoculture production system, ecological and economic effects were evaluated for nomadic rice-duck complex ecosystem. This work can provide scientific evidence for optimization and promotion of nomadic rice-duck complex ecosystem (RD) as a feasible alternative with reducing energy use and increasing economic benefits without decreasing yields and increasing labor intensity. 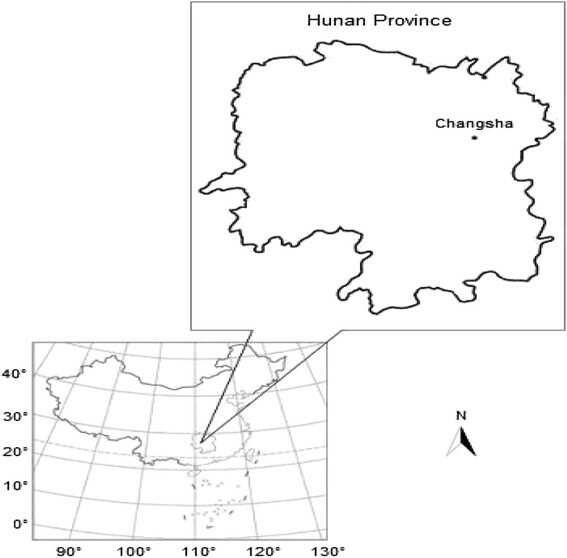 The study area - Changsha Wulong farm - was situated at 28° 16' N, 113° 63' E, in the northeast part of Hunan province (see Figure 1). Its arable area was 50 hm2, 90% of which was paddy fields. In 2010, it started to convert the mode of production from RM to RD. The soil was yellowish red soil with pH = 6.6 to 7.2 and organic matter = 3.0% to 3.6%, total N = 2.32 g kg-1, total P = 1.14 g kg-1, and total K = 11.6 g kg-1. Its basic climate condition was characterized by annual average sunshine time of 1,700 h, annual average temperature of 17.0°C, the coldest month (January) has an average temperature of 2.3°C and the hottest month (July) an average temperature of 30.1°C, frost-free period of 280 days, accumulated temperature (≥10°C) of 5,400°C, and an average rainfall of 1,450 mm, concentrating in the period from May to September. Map of Hunan province in southern-center China. Quantitative analysis was carried out in a 10-hm2 field for the RD, and a 10-hm2 field for the RM. Two treatment fields were separated by a fence. Data records of every input and output of these two systems were kept as raw data of energy evaluation and economic assessment. The information on the inputs and outputs of these two rice production systems, including labor (man and woman), fertilizers, diesel, electricity, electric motors, plastics-general, pesticides, fungicides, herbicides, irrigation water, rice seeds, ducklings, feeds (including formula feed and rice grain), rice grain yields, and ducks, were calculated and recorded during the 2010 to 2011 growing season. The energy content, transformity of the materials, and services were based on Table 1; the economic content was based on cash payments of these two rice production systems according to the price during the given years. aRanges indicate the lowest and highest values found in references; benergy equivalences are taken as the average value of the ranges; cthe composition and nutrition levels of formulas feed: corn (56.6%), soybean meal (15.0%), rapeseed meal (3.0%), wheat bran (7.5%), fish meal (2.0%), wheat middling (12.0%), limestone (1.3%), CaHPO4 (1.2%), NaCl(0.3%), Met (0.1%), premix (1.0%), metabolic energy (11.68 MJ kg-1), crude protein (16.68% kg-1); 17, Scott ; 19, Mandal et al. ; 20, Singh ; 21, De et al. ; 22, Intaravichai ; 23, Rutger and Grant ; 24, Mitchell ; 25, Pimentel ; 26, Kaltcshmitt and Reinhardt ; 27, Singh et al. ; 28, Pimentel and Pimentel ; 29, Leach ; 30, Hjortshøj and Rasmussen ; 31, B°Ckman et al. ; 32, Mudahar and Hignett ; 33, Hetz ; 34, Chamsing et al. ; 35, Acaroglu ; 36, Pimentel and Pimentel ; 37, Pimentel et al. ; 38, Anon ; 39, Stout et al. ; 40, Fluck ; 41, Green . The strains of the duck were Jiangnan No. 1 in 2010 and mallard in 2011. From 7 days after transplanting or 15 days after direct seedling to 10 days after flowering stage, the ducks were put in the rice field. A 10 hm2 field in the RD was divided into 5 units, the area of every unit was 2 hm2; the ducks were shepherded and cruised back and forth in the unit in the paddy field for controlling diseases, pests, and weeds. Every time in the unit was 2 ~ 3 days; the ducks got energy through eating weeds and preying on pests in the paddy field, while inputting energy for rice growing through casting of dung. A duckling allowed outside its cage was 7 to 15 days old of breeding. Ducks have an affinity for water; the farmer attracted them to the fields and kept them there long enough to benefit the crop through irrigation in cycles and scattering feed in the field. All procedures performed in studies involving animals were carried out in accordance with the guidelines issued by the Ethical Committee of Hunan Agricultural University. The indices including input energy (Ei), output energy (Eo), renewable organic subsidiary sources (R1), nonrenewable industrial subsidiary sources (F), net energy gain (NEG), energy ratio (ER = Eo/Ei), and energy productivity (EP = rice grain yield/Ei). A new index, product safety index based on energy (PSI = -C/(F + R1)), was also suggested to evaluate product safety, which was the negative value of the ratio of energy in chemical pesticides and fertilizers to the total purchased energy and in which C is the sum of chemical fertilizer and pesticide energy (Xi and Qin ). In addition, economic indices used were output/input ratio, gross income, and net income. The energy content and transformity of the materials and services are based on Table 1, and the economic content and transformity of the materials and services are based on cash payments of these two systems. Data collected were subjected to analysis of variance. The F-test was used to determine significant effects of these two rice production systems, and least significant difference (LSD) was used to separate means. The statistical software used was STATISTLX 8.0. The energy flows calculated for the two rice production systems are itemized in Tables 2 and 3. In the RD, the ducks were shepherded to crisscross in the 10 hm2 paddy field and they got energy through artificial feeding, eating weeds, and preying on pests in the paddy field, while they released energy for rice through casting of dung and reducing the quantity of fertilizer and pesticides. Rice grain and the ducks were the output energy entering the market. However, in the RM, rice growth and development depend on how much energy is on nonrenewable industrial subsidiary sources, such as inorganic fertilizer and pesticides; rice grain was the output energy entering the market. aThe numerical value of the bracket was percentage; bthe labor for feed duck was 65.0 h of man and 126.5 h of woman; cthe variety of duckling was farm duck (2010) and mallard (2011); the weight of duckling was the average weight of 50 g; dthe quantity of the feed was the quantity for feeding 500 ducks; ethe weight of duck was 500 ducks × 1.25 kg/duck(average) × 90.00%(survival ratio) = 562.50; fthe protein content per kilogram was 94.30 g (rice-duck complex system) of rice grain, 204.10 g of farm duck and 210.00 g of mallard; gthe quantity of the labor for man and woman, duckling, feed, plastics-general, electric motor, electric, and duck share equally to ten copies, which account for energy input in the system. aThe numerical value of the bracket was percentage; bthe protein content per kilogram was 83.90 g (rice monoculture production system) of rice grain. Tables 2 and 3 showed that total energy input in RD was 18,607.75 MJ (2010) and 18,482.20 MJ (2011), less than that of RM (19,030.32 MJ for 2010 and 18,904.77 MJ for 2011). We further analyzed the difference of these two rice production systems in the variety of energy input. The ratio of renewable resource, purchased nonrenewable input, and purchased renewable input to the total energy input were 13.52%, 73.37%, and 12.81% in the RD, respectively, and 13.22%, 84.39%, and 2.39% in the RM, respectively. In the RD, the ratio of purchased renewable inputs was the highest, but in the RM, the highest ratio was that of purchased nonrenewable inputs, which indicated the different feature of the RD and the RM. Total energy output in RD was 91,025.90 MJ (2010) and 94,568.36 MJ (2011), higher than that of RM (88,204.23 MJ for 2010 and 93,875.87 MJ for 2011). In the RD, the purchased inputs were dominated by fuel, fertilizer, and feed, accounting for 82.37%; for instance, the energy for feeding duck took 10.72% of the total energy inputs. By contrast, in RM they were fuel, fertilizer, and pesticides, accounting for 84.39%. Chemical residuals and NO3-usage are the main factors to impact the safety of products (Xi and Qin ). As shown in Figure 2, the values of PSI in the RD and the RM were -0.60 and -0.78, respectively; the data suggested that the safety potential of products in the RD was higher than that of RM. There were significant differences at the 5% level between the treatments on PSI. ER, EP, and energy profitability (PE) in the RD were higher than that of RM, but there were no significant differences at the 5% level between the treatments on ER, EP, and PE. Human energy profitability (HEP) in the RM was higher than that of RD, which suggested that the RD gained yield in paddy field through increased labor intensity but decreased agro-chemical energy, which belonged to labor-intensity farming method, as it conforms to China's national conditions. 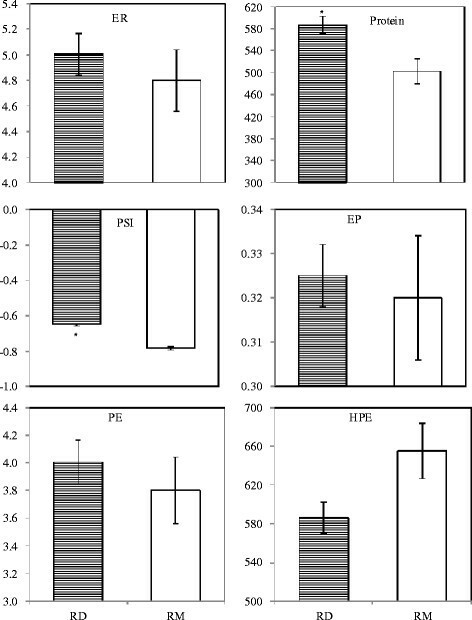 Protein content of grain based on rice production system in the RD was higher than that of RM, and the difference was significant between the treatments (p value <0.05). Energy indices in different systems for rice production in Hunan region, China . *represent significance at the 0.05 probability level. ER, energy ratio; PSI, product safety index based on energy; EP, energy productivity; PE, energy profitability; HPE, human energy profitability. As shown in Table 4, total input calculated by China Yuan (CNY) in the RD was 3,466.94 CNY hm-2 in 2010 and 3,718.68 CNY hm-2 in 2011, including 22% to 25% of the input for feeding ducks and 5% of the input for pesticides. Total input in the RM was 3,429.81 CNY hm-2 in 2010 and 3,566.72 CNY hm-2 in 2011, including about 11% of the input for pesticides. Total output in RD was 6,685.93 CNY hm-2 in 2010 and 7,746.04 CNY hm-2 in 2011, including 10% to 14% of the output of duck. The output/input, gross income, and net income in the RD were 15.26%, 39.51%, and 44.80% higher than that of RM, which indicated that the economic benefits of the RD were greater than that of RM. a1 CNY = 0.1571 US.$; bthe change of plastics-general and electric motor was 82.80 CNY and 300.00 CNY, respectively; service life of solid cost was 5 years; cthe wholesale price of rice grain was 1.00 CNY kg-1 in 2010 and 1.07CNY kg-1 in 2011; dthe wholesale price of duck was 10 CNY kg-1 in 2010 and 20 CNY kg-1 in 2011. Agricultural energy consumption has increased largely in response to increasing populations, a limited supply of arable land, and a desire for an increasing standard of living. In all societies, these factors have encouraged an increase in energy inputs to maximize yield, minimize labor-intensive practices, or both (Scott ). In China, half of the labor force in the countryside is made up by women accompanied with labor transfer of rural young men, due to the lack of remuneration engaged in planting. However, women could not alone finish rice production based on higher labor intensity. So, what we urgently need is an intermediate-type technology to both increase yields and minimize labor-intensive practice. The input energy of women's labor in RD account for about 60.0% of total input energy for labor (see Table 2) engaged mainly in looking after and feeding ducks, which belong to low labor-intensive practice. RD was a feasible alternative that could reduce energy use without decreasing rice yield and increasing labor intensity. More than one in seven people today still do not have access to sufficient protein and energy from their diet and even more suffer from some form of micronutrient malnourishment (Food and Agriculture Organization of the United Nations (FAO) ). The duck in the RD could provide meat protein and other micronutrients. Another mission of Chinese or global planting is to guarantee the quality and safety of production by all means. Conventional energy-intensive farming depended on fossil fuel and pesticides, which is not competent now. Effectively changing the structure of purchased energy ratio for the RD, by comparison with RM, can significantly increase PSI and the quantity of protein (see Figure 2). Currently, we could not extend and realize organic farming in a large area, and advanced biotechnology for agriculture has not been used for rice production yet. Consequently, we recommend the RD as an intermediate-type technology to settle this issue. The economic benefits of rice production seriously affect farmers' enthusiasm for rice production. Low earning in the countryside force farmers to go to the city to make a better living; thus, many farmers have to abandon their farmland. Once farmland is abandoned, the soil is exposed to sun and rain, resulting in erosion and further impoverishment of the soil. The output/input, gross income, and net income of RD were 15.26, 39.51, and 44.80%, respectively, higher than that of RM (see Table 4). Adopting the nomadic rice-duck complex ecosystem, to a certain degree, can improve farmers' enthusiasm for rice production. RD as an intermediate-type technology is a feasible alternative as it could reduce energy consumption without decreasing rice yield and increasing labor intensity, and as a classic farming technology in China, it was inherited for the development of Chinese farming culture. RD could reduce energy input, increase energy output, and change the structure of purchased energy ratio. The purchased renewable energy in the RD account for above 25%. In RD and RM, the values of PSI were -0.60 and -0.78, respectively, which indicated that the safety potential of products in the RD was higher than that of RM, and protein yield and protein based on system in the RD were significantly higher than that of RM. The output/input, gross income, and net income of RD were 15.26, 39.51, and 44.80%, respectively, higher than that of RM; thus, the data suggested that the economic benefits of RD were greater than that of RM. We thank Mr. Chen and his wife in Wulong farm who gave a great deal of help to record and collect the study data. We also thank Dr. Huang Min at Hunan Agricultural University for his valuable suggestions on this paper. HZ carried out the field experiment and recorded raw data of energy evaluation and economic assess, and drafted the manuscript. HH and DL conceived of the study and participated in its design and coordination. XL, ZF and CC participated in the design of the study and performed the statistical analysis. All authors read and approved the final manuscript.